do not like haircuts. they feel very bad. your son handles that alot better than me and I am 30. Hi Jayson. Thanks for commenting and sharing your experience regarding haircuts. 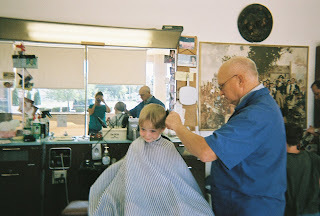 My guy still gets a little nervous when grandpa's buzzer comes out, but it helps that he trusts the barber and that he is more hypo-sensitive than hypersensitive to touch. actually i should thank you for the blog. It is nice to know that others have the same problems..okay, that did not come out right at all. I do not mean to say that I am happy that your son has autism....lol I should stop typing while I am "ahead." I am more hypersensitive to most stuff though there are some things that I am hyposensitive to. wow this only took about 15 minutes to write, if I keep going I could write another book. hmm it is not recognizing my password so i shall post annonymous. No offense taken. You are welcome for the blog. Sometimes I wonder if my more personal posts are helpful to anyone, but they are my favorite posts to write. My son's ears are hypersensitive in regards to hearing. Hence the nervousness when grandpa grabs his buzzer. Maybe someday he'll opt for a rocker-style shag to avoid the sound of the buzzer, but for now we'll stick to the standard boy hair cut. He seems happy enough with his haircuts. 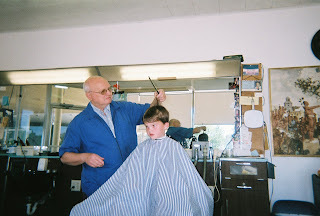 I forgot to mention that after each hair cut he always peers into the mirror in the back of grandpa's shop. We always hear, "Oooh, I look sharp!!"